Pathway is the fifth studio album from Swedish power metallers, Nostradameus. I haven't followed the band closely since their first couple of albums. From The Third Prophecy onward, their albums just didn't catch my attention, and Nostradameus simply got lost in the flood of power metal bands for me. After hearing their new opus, I can't say that my feelings have changed. While not a bad album at all, Pathway is certainly an unspectacular album that very likely will be buried amongst other second tier power metal bands out there. 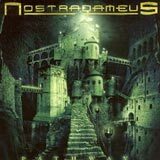 This time around, Nostradameus has adopted a sound that leans more toward US Power Metal with some thrash elements. Their earlier work was more straight forward European power metal, but they began to shift away from that with their third album. Hellbound continued that trend, and Pathway pretty much picks up where Hellbound left off. As far as strengths go, the guitar work is Nostradameus' biggest asset. However, the musicianship is well above average right down to the rhythm section as well. Thrashy riffs combined with a chunky and heavy sound form the backbone of this album. Some Judas Priest (mainly with the dual leads and solos) and even Iced Earth (the riff behind Wall of Anger being a great example) styled guitar work can be found as well. Many times throughout the album, technically interesting guitar solos burst through the speakers give the songs some extra flare. The rhythm section is also stellar on this album. Notably, the bass guitar is played with aggression and authority, which gives the guitar sound a big, thunderous quality. Furthermore, the drumming is varied, but galloping and heavy throughout. Based on technical ability alone, Nostradameus have the ingredients to be a truly killer band. One aspect of the band's sound that continues to dim my interest is the lead vocal performance of Freddy Persson. Frequently, he reaches for high notes that are simply beyond his range to deliver effectively. Aside from that, Persson is a serviceable vocalist, but one that absolutely does not distinguish himself from any of a great number of power metal vocalists out there. On the bright side, Persson mixes in some angry, almost death metal vocals on this album, which add a new and interesting dynamic to some of the songs. This mixes very well with the thrashy, aggressive styled riffing and galloping drum work of the album. I'm sure that many will find this to be a welcome deviation from the happy power metal that is still very commonplace. My biggest complaint about this album would be the blatant lack of memorable choruses and melodies. With the exception of Wall of Anger, Death By My Side, and The Untouchables, the choruses and melodies just fall flat. After a few listens, it's easy for some of the songs to start running together as they sound too ordinary. Despite that, the musicianship is stellar throughout the album. Although many of the compositions themselves are very mediocre, the musical performances do sell themselves quite well. If the entire album contained compositions of the same caliber as the above mentioned songs, we'd be talking about a gem of an album here. However, the very average songwriting that forms the majority of the album is a weak point for the band. To sum up my thoughts on this album, Pathway is a decent album from a band that has the potential to be much more. If the band could come up with some more memorable choruses and melodies, the potential of this band would be fully realized. I like the aggressive, thrashy turn that the band has taken. However, I need to hear consistently better (memorable) songwriting before firmly recommending this band. A few of the songs on this album illustrate just how amazing Nostradameus can sound when their tight musicianship is applied to killer songs. Unfortunately, much of the album features mediocre songs with brilliant musical execution.